With the recent popularity of YoYoFactory’s hubstack system, it’s a good time to take a look back at some similar yo-yo innovations from the past. 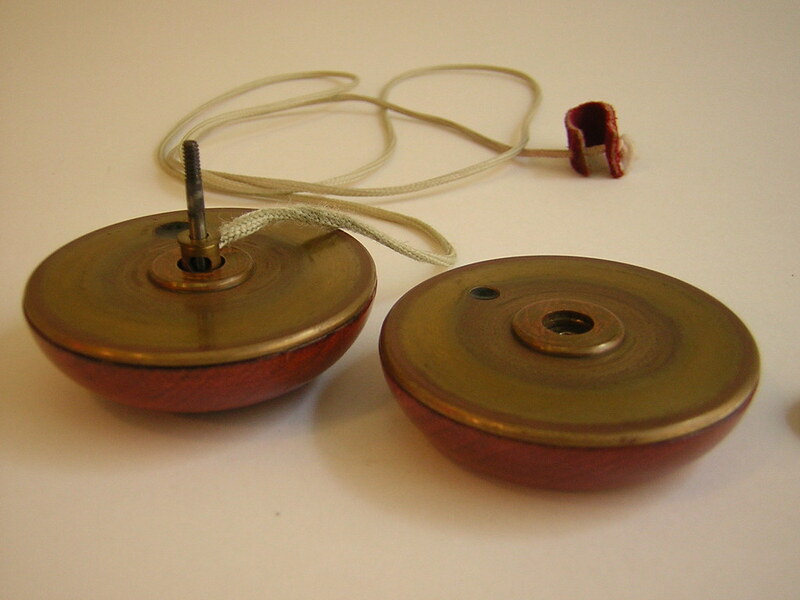 Some folks like to point out that yo-yos with free spinning caps or ball bearing tips were being made back in 2002, but nobody has mentioned the Titania yet. The Titania by Doble Yo-yo was really a head of it’s time. 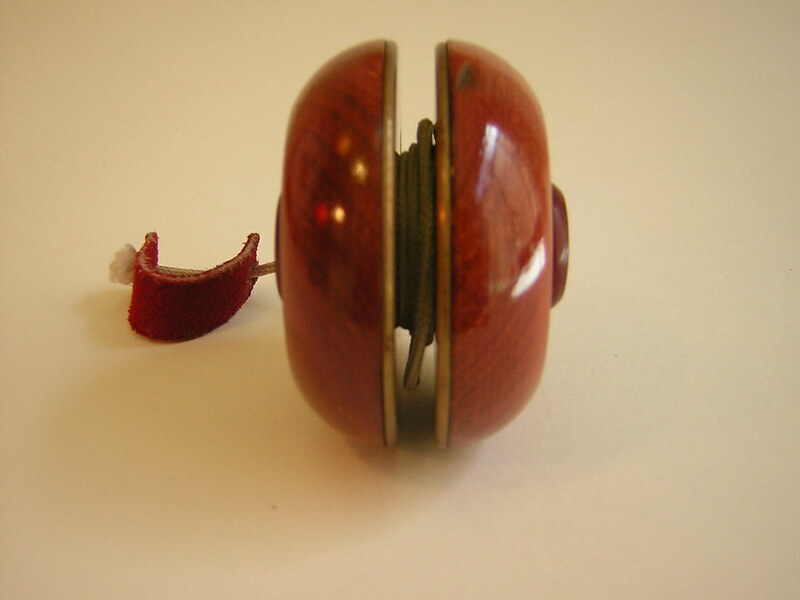 In 1993, the Titania (along with Doble’s Ariel and Calypso yo-yos) became one of the first patented adjustable gap yo-yos. What makes the Titania so noteworthy though is that it is designed from two free spinning halves with a solid axle running through the yo-yo with two knobs attached at either end. Making this the first yo-yo that you could grab by the hubs while it was spinning. So hubstack and spinning cap mods usually consist of a normal yo-yo with added ball bearings on either side, but the Titania has the same effect by using one extra large axle and two loose halves with holes drilled all the way through. For it’s time, the Titania was probably something of a modern marvel, although the company never seems to receive much recognition for it’s innovations. As a matter of fact, it wasn’t even until a few years ago that competitors started using the company’s Calypso to break world sleeping records, even though it had already been around for over a decade. The Titania does not have any ball bearings (which probably could have helped it out), but with it’s heavy weight (120 grams!) and unique trans axle system, it could still out-sleep most (if not all) the other trans axle yo-yos of it’s time. 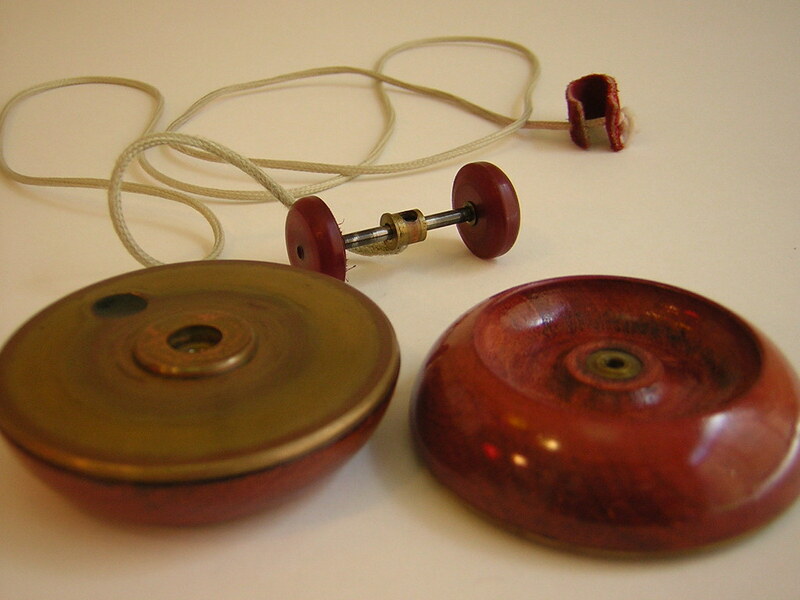 Due to the yo-yos weight, it used a very thick cord that was tethered to a small free spinning brass sleeve. The cord was also equipped with a leather finger loop. By today’s standards, is a cool looking, but clumsy yo-yo with a narrow gap (in fact Doble has never made a butterfly yo-yo), but the idea of a solid post with free spinning halves could still be a good idea. When you try to grab the hubstacks on an 888, you are grabbing parts that are moving and stopping them. Even with good ball bearings this is going to add more drag on the yo-yos momentum, but with a solid axle, the hubs are never spinning… so they are easy to grab and don’t add any extra friction to the yo-yo when they are held. I recently checked and Doble is still quietly making their beautiful yo-yos, please check out their site, www.dobleyoyo.com. 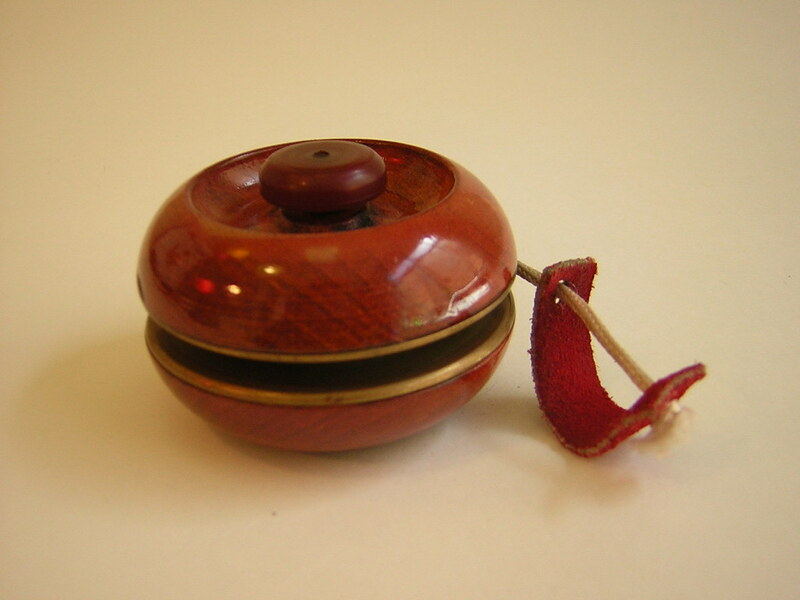 And here is a great collection of yo-yo patents online. I think the problem is in getting the two halves to spin at the same speed to prevent uneven precession. It doesn’t seem to be too big of an issue with this yo-yo. If one side slows down, it does cause a little procession, but it’s not that much and it usually happens near the last few seconds of spin anyways. Doble actually did make a butterfly shape yo-yo, it was just not released yet. It was a narrow butterfly, that he was having issues with keeping stable. The first one I got was almost un-usable, but the 2nd and 3rd were pretty solid. It is a great fixed axle yo-yo. 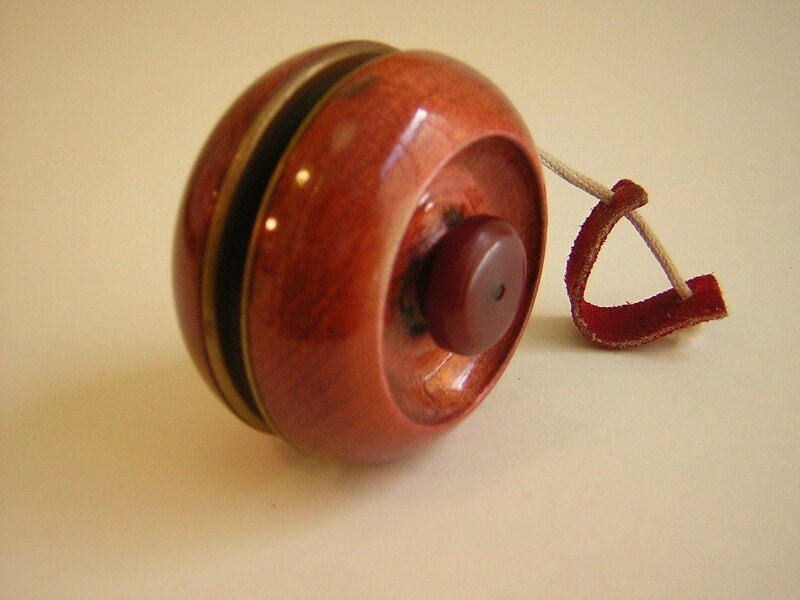 I was under the impression that Doble was going to release the yo-yo, but I have not heard or seen anything new from them in a few years…..so maybe it is on hold?